Doug Volin has more than 17 years of experience in emergency medical services, spending the past six years with Lakes Region EMS. Doug started his career as a Firefighter/EMT-Basic, quickly deciding that he wanted to become a Paramedic. Now, Doug is a Paramedic Field Training Officer, SWAT team medic and employee liaison on our Board of Directors. Over his career, Doug has shown consistently how to lead through example. Doug has the ability to take a very stressful call or situation and turn it into what feels like a routine call. As a Field Training Officer, Doug’s ability to push new hires and Paramedic students to learn from their calls and expand their knowledge is what makes him an important part of our organization. While working full time at Lakes Region EMS Doug made time to complete our Critical Care Course. Doug has also been chosen to serve on the organization’s Board of Directors as an employee liaison. Lakes Region EMS is proud to nominate Doug as a 2017 Star of Life. 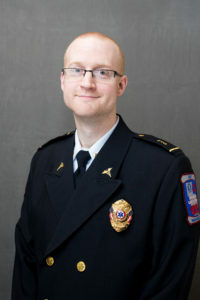 Doug Volin has been a Paramedic-FTO with Lakes Region EMS for 6 years. In that time he has shown consistently how to lead through example. He has the ability to take a very stressful call or situation and turn it into what feels like a routine call. As a Field Training Officer, Doug’s ability to push new hires and paramedic students to learn from their calls and expand their knowledge is what makes him an important part of our organization. While working full time at Lakes Region EMS Doug made time to complete our Critical Care Course. He was also chosen to serve on the organization’s Board of Directors as an employee liaison.